In December 2017 the Hartford town manager proposed budget cuts of over 10 percent to Hartford’s three incorporated libraries, Quechee, Wilder and Hartford. This was proposed despite the fact that they provide approximately 90% of the circulation of items townwide in a totally integrated system that is open to all residents and visitors at no charge. This proposal recommended no cut to the West Hartford Community Center & Library (WHCCL). We developed this page and other responses to provide essential background for budget decision-making, showing a history worthy of pride and ongoing support from the town, from individuals and organizations. We are grateful that ultimately the libraries were fully funded as to their requests for the 2018-2019 fiscal year. This page will remain available going forward to provide essential information about an admittedly complicated library system. 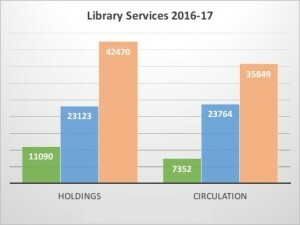 A look at the number of programs and attendance for those services, consortium and state participation, technical services, and outreach services reveals even more clearly how library services are delivered in Hartford. 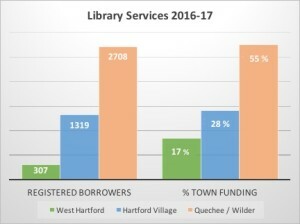 The graphs below reflect the services and funding for the WHCCL, the Hartford Library, and the combined Quechee / Wilder Libraries. The Wilder Club and Library’s services have been administered by Quechee since 1997. It is essential for the town governing board and administrator to have an accurate understanding of the history, the benefits, and the quality of the non-profit public libraries. Incorporated libraries (rather than being less worthy of municipal support) are an incredible value for taxpayers. The incorporated library facilities have grown from 465 sq feet in Quechee in 1909 to today’s 6000 square feet further down Main St. while Hartford and Wilder have carefully preserved their historic buildings—-all without taxpayer expense. Tax allocations are used for the operating expenses of these public libraries AND are supplemented by fundraising efforts as well. Vermont state statute, while stating that library service provision is every town’s obligation, makes clear that a town can provide this through municipal and/or incorporated libraries. A very important point is that Hartford ‘s multiple and different types of public libraries (a unique situation) results in continued confusion and competition. Again, see the citations below to understand that by state statute there is no distinction in the nature of these public libraries (municipal or incorporated) re a town’s obligation to fund the providers. Equally important to note, is that– at a different selectboard’s request– Quechee, Wilder, and Hartford migrated to new software and a 59 library consortium (VOKAL) to provide a totally integrated cataloging and circulation system. All library holdings are clearly visible and available to all Hartford residents and, upon request, transported to any library or picked up by requesting individual. At that same time the Quechee Library tech services librarian’s position was expanded to allow him to do this migration and to automate the one municipal library, West Hartford Library, and include it in the integration. He did so. Passionate attachment to its villages is Hartford’s bane and ‘glory’. Each village has historically undergone peaks and valleys; they have been farming villages, mill villages, abandoned villages, re-born villages. But in each village there arose a group of people who so believed in learning, in books, in education that they founded a library. None of them were municipal libraries at the onset, but in 1927 the West Hartford Library was destroyed by a flood. 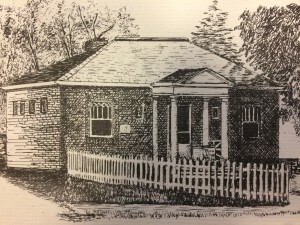 When West Hartford, Connecticut donated money to the town to rebuild that library it became a “municipal” library as the town became the owner of that building. Therefore, its employees are town employees and its trustees are elected by the town. After Tropical Storm Irene, a huge taxpayer investment was made in that building, with cost overruns, after it was again ravaged by a flood. To be called West Hartford Library and Community Center, there was at that point an agreement that the library services were to be delivered by the other libraries while the rec department was responsible for other elements. The WH Library Board chose not to contract with the other libraries other than for automation and a preliminary period. Hartford village has its own incorporated library, housed in a historical building on Rte 14. See www.hartfordlibrary for more information or stop in. In Wilder, Charles Wilder’s concept of a complete 19th Century community center that included a library (as well as a pool room, auditorium and even a bowling alley) resulted in the Wilder Club and Library. He left a small endowment that has been husbanded to help support the building. Hall rentals contribute to support but are kept to as low a fee as possible to allow the community to use it for family and other occasions. In Quechee the library was first a milliner’s shelf, then a general store shelf, then housed in a bandstand. It next moved to a 465 square foot gem on Main Street, designed to be a library. When the National Geographics were stored in the bathroom, a book could not be added without removing another, and Quechee Lakes brought a new population to the abandoned mill village, a building campaign was begun for a new library. We moved, after several temporary quarters when volunteers trundled books and furnishings to loaned spaces, to 1957 Quechee Main St. That building was built—please pay attention here, in part by a $100,000 LSCA federal grant. That is an extremely important fact. The federal dollars, won in a very competitive grant process, were given with the town’s assurance it would continue to support this library. It was furthermore given because Quechee Library had by this point clearly become the primary library service provider in town. We had ceased to be a village library. Had we been wiser, we would have changed the name. However, probably because the town’s many libraries (other than the now closed Gates Memorial Library in White River Jct.) had been named for the villages where they originated they have ever since been called village libraries. 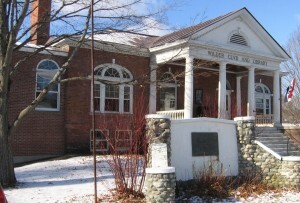 Quechee/Wilder Integration: In 1997, the Wilder Club and Library trustees made the difficult but forward-looking decision to contract with Gates and Quechee to administer library services in an attempt to reduce the redundancy and inefficiency of five distinct libraries in one town. At this point there had already been numerous attempts to improve cooperation. The Wilder board acknowledged too that it was very difficult to keep a professional librarian for long in the part-time small library despite its being a key part of the Wilder community. After Gates closed, Quechee continued the contract with Wilder and, following automation, the two libraries became a truly integrated service. Circulation: 36,000 to 41, 000 items circulated on average over the past several years by the Quechee/Wilder Libraries to patrons visiting both sites and taking advantage of various types of outreach including the Bugbee Senior Center, daycare centers, and a pickup/drop off box at the Upper Valley Co-op, as well as downloadable books. Programs: Three to four monthly book discussion groups for adults (we not only host our own sci fi, mystery, and Bugbee Senior Center series but also Vermont Humanities Council scholar-led series including some that we have ourselves created. Along with weekly storytimes, five monthly daycare visits, holiday programs, and summer afternoon programs for grade schoolers, we have added another weekly children’s program for homeschoolers. (Please note attached statement from Kerry McDonald and others as to the value seen.) This is a village with three schools that is often described as having few children. Like any library, it is also a safe place for children after school waiting for parents to pick up. We have a close partnership with both the Ottauquechee Elementary School and the Waldorf School. During the school year, the Wilder School weekly visits the Wilder Library where our librarian provides a program and book suggestions. Approximately 38 to 40 percent of our total annual circulation is juvenile. The additional adult programs range from concerts, author visits, discussions on various issues by distinguished speakers (one recent example, law professor Peter Teachout on the Bill of Rights), celestial viewings led by trustee and astronomy professor Brian Chaboyer which have each time, including last August for the solar eclipse, brought scores of people to witness, learn and share a communal experience. We streamed the NASA coverage on our new video equipment granted by the Vt. Dept of Libraries and available for public use. Vermont Reads is a statewide reading program of one title selected annually. The Quechee/Wilder Libraries for years have created a series of multi-generational programs that leads to a grant of dozens of book copies. Last year’s title Brown Girl Dreaming brought historian Sarah Rooker, who helped lead one discussion, to stop in recently to say that she had developed curricula for 50 school teachers based on her involvement here. She added that she found our library to be a great resource in her work. Northern Stage produced a Youth Ensemble program based on the book and staged it at the Wilder Club and Library. We have regularly had outreach services at the Junction Teen Center in WRJ. Currently that service is in hiatus due to a staff change. Needleworkers United meets weekly upstairs, coordinated by one of our trustees. TECH SERVICES: Both Quechee Library and Wilder Library (as well as Hartford) have fiber optic internet, based on a Vermont Dept. of Libraries grant. We maintain nine networked computers at Quechee and three at Wilder, plus laptops. Seven are public computers. Staff is available for tech advice and is often doing just that. Many residents and visitors use the computers and printers, as well as fax and scanners. They include VA outpatients, Northern Stage visiting actors, traveling nurses, and people without the means to own personal computers. It is essential that it be understood that access to computers is an extremely important service. Only the incorporated libraries must provide the IT support to maintain them as well as to do the staff work of cataloguing, circulating and communicating. Quechee has negotiated with the state and consortium on behalf of all the Hartford Libraries for fair pricing on ListenUp and RbDigital again because of the unique multi-library situation in this town. We also subscribe to online foreign language courses, Universal Class, Vermont OnLIne Library for a host of resources for all ages, and Heritage Quest….all available to all Hartford residents. Collection: 39,202 volumes include media, magazines and newspapers. *The Vermont Department of Libraries has strongly emphasized over the past five years ever-increasing sharing of resources statewide. With the Green Mountain Library Consortium, it has put in place a courier system for 55 libraries and intends to increase that number. Quechee Library loans hundreds more items(between 700 and 1000 annually) to other libraries than it borrows due to the quality and depth of its collection. Quechee Library has incurred increased courier and postage costs. Again, it is important to note that a primary goal of this direction is to insure that smaller and more rural libraries have equal access to resources. Consortium Roles: As members of VOKAL, we have taken on the responsibility for active participation as required for Hartford by having one staff member serve on the cataloging committee and one on the circulation committee. Our former tech services librarian was an executive committee member. Meeting Space: At Quechee the downstairs room is regularly used by the Upper Valley Stamp Club, a support group, and teachers offering tutoring. The Vermont Bowhunters Association has begun to meet here, and various state agencies and non-profits hold occasional meetings as well as, of course, for study groups led by the Hartford Planning Department. At Wilder, scouts and theater groups use the hall regularly. Rentals for individuals and groups are an important source of income for the building’s maintenance. All scheduling is handled by staff during regular hours. Building Stewardship: At both libraries most maintenance is done by volunteers, members of the board of trustees and others. This is at tremendous taxpayers’ savings cost. Both libraries have been recipients of very competitive Vermont grants, ranging from $7500 to the maximum $20,000 multiple times. Quechee Library was also for years the beneficiary of the SunUp Fdtn (benefactor now deceased). That foundation, along with Mascoma Savings Bank Fdn and the Byrne Foundation and numerous fundraising efforts and donations led to solar panels at Quechee, ac systems at both sites, and major building projects at both sites including lifts for accessibility. At Wilder it was all done with careful attention to preserving the historical integrity of the building. At Quechee beautiful gardens are maintained by the Garden Club. At Wilder yet another fundraising project restored the war memorial. Volunteers: The value of donated volunteer time and skill to these incorporated libraries cannot be overstated. It would be impossible to staff two sites, do the outreach, programs, and fundraising that we do without over 30 very active volunteers including the Friends formed in 1994. Staff, Friends presidents and trustees have time and again been asked to speak at Dept. of Libraries conferences and to review other libraries’ long range plans after multiple successful completions of ours. One instance, the Quechee board president has created and overseen our website. Wilder board members have donated uncountable hours to maintaining the building. 1995: $100,000 federal grant as part of $450,000 building campaign for new library at 1957 Main Street. 1997: Wilder Club and Library contracts with Quechee and Gates Library for administration of library services. After Gates closes (as a small incorporated library it could not maintain its compromised building and had a limited circulation). 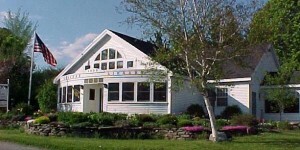 1999: QuecheeWilder Libraries automated, among the first Vermont libraries to do so. 2002: Addition of lift and children’s room and upstairs room, downstairs bathroom, through private fundraising and Freeman Foundation Grant. 2004: Vermont Cultural Facilities grant to Wilder Club and Library to add storm windows and install hot water to all sinks. 2004: Vermont Arts Council grant: Changing Nature of Land and Photography. This is perhaps one of our favorite grants. Working with Northlight Digital and Collamer we selected several of his prints from the 1950s in Hartford to be scanned, enhanced and printed by Northlight. Many exhibits have grown from that beginning, including the mural that is behind the Selectboard. There was also a wonderful panel discussion at the library with Collamer—who is perhaps remembered by us almost as fondly for his statement at one of the many townwide library meetings that if he still had his bicycle he’d be happy to ride it to Quechee on a regular basis. Instead, we delivered books to him in WRJ and keep him in our minds today for his ever-curious, wide ranging mind and wit as well as his marvelous photography. 2007: Wilder Club & Library wins Vermont Historic Preservation grant to repair and restore windows and restore the plaster facade over the porch. 2007: Wilder Club & Library wins Vermont Cultural Facilities grant to support the construction and installation of an accessible platform lift. $90,000 project was completed with the assistance of other foundation grants, business and individual support to make the historic building accessible without impacting its brick exterior. 2011: Wilder Club & Library wins Vermont Cultural Facilities Grant for installation of new front steps with new granite treads. 2012 : Migration to VOKAL and koha for a completely integrated townwide system. 2014: Addition of OneCard….along with renewed emphasis by VT Dept. of Libraries for ILLs, courier system, and the sharing statewide of resources. OneCard is an agreement among 13 Upper Valley libraries that patrons from each other’s towns may borrow directly from member libraries. 2017: Vermont Cultural Facilities Grant to Wilder Club and Library for the installation of an energy-efficient air conditioning system in its auditorium. 2015-2018: Building stewardship: New flooring at Quechee required two campaigns, and is to be followed by window and clapboard replacement. Trustees of both boards take extreme care to keep buildings well maintained. In Wilder that included a furnace replacement and new granite steps. Volunteers provide many hours and skills to save on contracted labor costs. 1) Incorporated libraries in Hartford must raise all funds for capital expenses without taxpayer support. The buildings are owned by non-profit 501c associations and governed by self-elected boards of trustees. Staff are not town employees and do not get health or retirement benefits. In the past 20 years, Quechee Library has built a new library, then built an addition that includes full handicapped accessibility, a children’s room, and a meeting room without tax dollars. This has been done through various grants, tremendous support from local foundations, the QLLA and Quechee Club community, individuals, and local businesses. SunUp Foundation was a key supporter who provided the funds for the solar panels among many other assets. Byrne Foundation and Mascoma Savings Bank Foundation have been consistent in their support for both Quechee and Wilder. Wilder Club and Library has continued to win grants and fundraise to preserve, enhance and make their historical building accessible. Clearly this is all at a great savings to taxpayers. 2) The Friends organization of Quechee/Wilder Libraries active in providing volunteer support and direct funding—approximately $6000 a year, We see literally hundreds of hours of volunteer support, ranging from holiday ornament making for children to ripping out and installing flooring. 3) Staff—exceptionally professional and long-serving, skilled at tech support, grant writing, and programming. They get NO health insurance or retirement benefits. Two sites (with considerable outreach) are staffed by less than 3 f.t.e. Our libraries are already very dependent on volunteer aid for numerous library and building tasks, but sophisticated system requires continual professional oversight. Staff also handles all meeting room administration at both libraries. This includes several regular groups at Quechee Library and the rentals that fund an important part of building expense at Wilder. 4) No additional municipal support at taxpayers’ cost. Operating expenses include plowing, sanding, tech maintenance, all building expenses, that are found in different budget line items for a municipal library. (a) The General Assembly declares it to be the policy of the State of Vermont that free public libraries are essential to the general enlightenment of citizens in a democracy and that every citizen of the State of Vermont should have access to the educational, cultural, recreational, informational, and research benefits of a free public library. We ask the town government to respect the history of the incorporated libraries of Hartford town and their proven ability to move forward with the complete and complicated library services that, as always, offer all residents fair and equal access to needed information as individuals and community members. We ask that the board and manager consider that well-meant support of village centers does not necessarily equate with proportional and proven modern library services essential for an educated, informed citizenry. Going forward library services must continue to evolve.